Can Riding a Roller Coaster Actually Help Pass Kidney Stones? They say laughter is the best medicine. Now, for the hundreds of thousands of people who end up in the emergency room every year because of painful kidney stones, a trip to Disneyland may be just what the doctor ordered. Michigan State University medical scientists recently confirmed their theory that riding roller coasters could help with passing kidney stones, hard deposits of insoluble calcium compounds lodged in the kidneys. Professor and urologist David Wartinger began to consider the legitimacy of such a treatment when several patients reported passing stubborn kidney stones after riding a roller coaster. Oddly enough, these patients weren’t just talking about any old ride. They kept naming one in particular: Walt Disney World’s Big Thunder Mountain Railroad in Orlando, Florida. So Wartinger, being the true-blue scientist that he is, decided to test the coaster out himself. He recruited a colleague, Dr. Marc Mitchell, and together they begrudgingly made the journey from Michigan to Florida. “It was a terrible burden,” Wartinger tells NBC News, a cross he had to bear in the name of science. To test the theory, the urologists crafted a kidney model out of silicone and filled it with actual human kidney stones. While on the roller coaster, they nested the artificial kidney in a backpack between them, positioned at kidney height. And after 20 rides? Those suckers came right out. 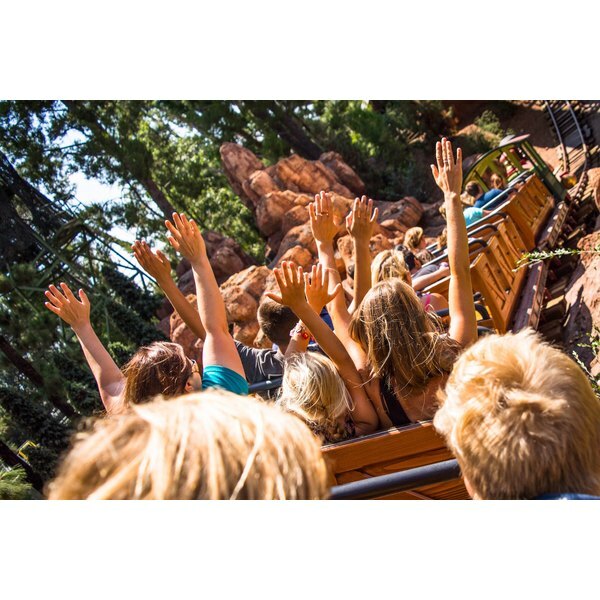 The back of the roller coaster proved optimal for kidney stone passage, the urologists report in The Journal of the American Osteopathic Association. While in the front seats of the Big Thunder Mountain Railroad they came out at a ratio of four in 24. But 23 of the 36 kidney stones popped loose when in the back. In order to pass a kidney stone, you need to get it out of the tubes in your kidney and into your ureter — the thing that takes your pee down to your bladder and out the front door. So it might seem that riding a roller coaster works because it jostles your kidney around and loosens the stones. However, City of Hope urologist Clayton Lau remains skeptical. It’s a long journey down the ureter, he says, and a good shaking will only get you so far. Instead, he suggests, the adrenaline triggered by the thrill ride might be the real cure here. Furthermore, Wartinger cautions anyone who might try to skip the doctor’s office and go straight to Disneyland. Any stones bigger than four or five milimeters could get stuck in your ureter. “That’s when you feel like you are giving birth to a porcupine,” he says. This treatment might be best for people who know their kidney stones are small or people who want to prevent kidney stones altogether. The pair of pioneers have since tested their theory 200 times, and their findings are consistent. Now they want to move on to other rides and amusement parks. But the question that’s really burning in the back of our minds they have yet to answer: Do they have to wait in those long lines like a regular schmuck, or do they get special privileges for their benevolence? Are Kidney Punches Allowed in Boxing?